Content has been described as “something that is to be expressed through some medium, as speech, writing or any of various arts.” Pre-internet, it was mostly text with some images. Today, content might be text, images, videos, audios, and more to come. Content is delivered via any number of media, from print to websites to email to television to social platforms. This page will include resources and training on how to maximize the benefits from your content. 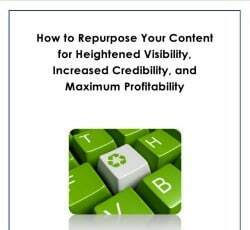 Connie Ragen Green’s e-booklet discusses various ways to repurpose any “piece” of content, such as a blog post. Click on this link to open the PDF in a new tab to read online, or right-click to save the file to your desktop or device.